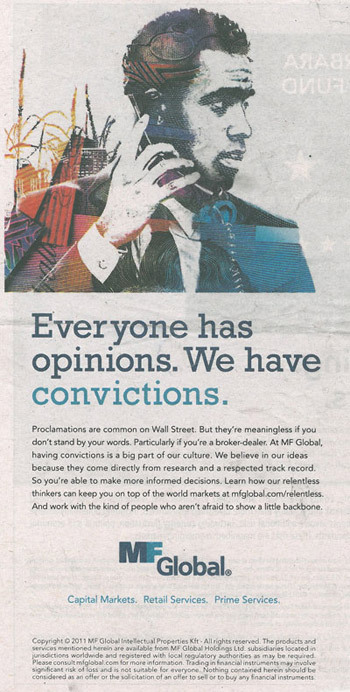 Not many people know about the convictions behind how MF global failed. This is how the destruction process works @ Wall Street and MF Global bankruptcy was one of the example of it. They were very bad in Europe; leveraged 33:1 so there is no space of error when the firm is leveraged like that. Accounting loopholes have to be closed and oversight improved. Non-bank financial firms should have a lead regulator. Rule-writers should consider “non-systemic” firms as well as “too big to fail” banks. More regulation, more rules, Dodd Frank/EMIR/FATCA and to no purpose at all.